Reviews of the latest guitars, amps, and accessories. Latest news from SM Guitars. Guitar related comment. As guitarists we are proud of our collection of guitars and often take every opportunity to post pictures on Facebook, twitter, Instagram and other social media sites. We love to discuss our guitars and the reasons we chose this particular guitar. We are careful in choosing each and every guitar and spend a long time looking for “the one”, and then, more often than not, we buy it off the internet. We are happy to spend our hard-earned cash on an instrument we have never seen or played before, from a shop we have never visited before. We often buy guitars based on video reviews we have seen on the internet, often by the same people who work for the internet shops that are trying to sell you the guitar you are interested in. Not really a subjective review in my opinion. Over the last couple of days I have been spending some time working in my local music shop and I have learned a lot. Your local music shop is not just somewhere to buy instruments from, people come in for advice, a chat, and sometimes, just to look at the guitars. Local music shops are a community hub for the musicians in your area, and many bands are formed and ideas swapped in them. The staff are usually friendly and are more than happy to offer help and advice in any area of music. By visiting your local music shop you get to play your guitar before buying and, after you have bought the guitar, have access to great, face to face customer service that you can not get over the internet. Often people will visit the local shop to try a guitar, and then buy over the internet for less money than the local shop can sell for. The trouble with this is that the same model of guitar can feel completely different when set up. The one you receive from the internet may well play totally different from the guitar you tried and liked in the shop. I can understand why we buy from the internet, the prices are often lower, and we can have next day delivery on a greater choice of instruments, but do me a favour. The next time you are looking for a guitar, visit your local music shop first, try out the guitar you fancy buying, and ask the owner, can you price match this guitar? They often can and sometimes can beat the internet price, also don’t forget to add in the delivery charge. Another great benefit of visiting your local music shop is you can try a selection of instruments, and if you forget about brands and names, may well surprise yourself at the instrument you like. I recently tried a copy of a popular guitar which was priced at £149 and I can honestly say it was the best version of that guitar shape I have ever played. The point I am making is I think we should support our local music shops or we may well lose them. One final point, if you break a string or have lost your capo at 4.30pm on a Saturday and have a gig that night, will the internet be there for you? Have fun and support your local music shop. I have never used a capo before. I always viewed them with suspicion and would play the most ridiculously voiced chords to avoid using one. That is until a student of mine turned up with a new capo. It was made by a company called G7th. I tried the capo for myself and as soon as the lesson had finished went and ordered one. Read on to find out why. First of all it looks really cool. They are a kind of brushed metal finish, zinc-alloy im told, and they don’t have any of those levers that stick out of other capos making them look like some kind of medieval torture implement. The capo has a very sturdy feel to it and has protection in all the right areas to protect your guitar from any damage. They work on a kind of clutch mechanism which means that the pressure is incredibly adjustable. The capo is incredibly easy to use, put it over the top of the neck and squeeze the bottom together to the correct tension and you are good to go. They can be speedily removed by flicking the tab on the top to release the capo’s grip and can be clipped to the end of your guitar for storage. These capos work on 12 strings, 6 string acoustics, electrics, and unbelievably it even works on my floyd rose equipped Ibanez. 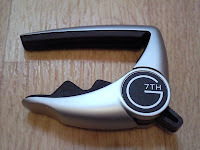 I have now had my G7th capo for three years and it works and looks as good as the day I bought it. The capos are a little bit more expensive than some other brands, coming in at just over £20 on amazon, but the quality of this capo justifies the extra expense in my opinion. I am converted to capos and can now play in Eb without risking severe injury. Guitarists are notoriously obsessive about their sound. We spend hours, weeks, months, possibly years searching for the elusive sound we hear in our head. We work hard, save our money, sign the credit agreement, for the latest megawatt all tube modelling digital amp. Endlessly search through magazines and the Internet looking for the perfect guitar and countless hours stomping on stomp boxes and editing patches all in pursuit of the perfect sound. After spending all this time and money looking for the perfect equipment we then go down the local music store and buy a length of bell wire to connect it all together. Having been playing for over 25 years ive been through a few guitar cables in my time. Can anyone remember the curly cables that used to stretch so far and then twang out the front of your amp or worse still pull your amp off the chair it was on. I remember in the 80’s all cables had to be day glow yellow or vomit green. How many times have you bought a cable with a lifetime guarantee that six months later fails mid gig. Nowadays the ends are sealed so in the event of it breaking you can’t re solder the end. This minor irritation was starting to become a major headache when, mid gig as usual, another cable bit the dust. I then did something I should have done years ago. A quick Internet search brought up a list of suppliers of quality cables and a few days later I had my shiny new cables. Guitar cables DO affect your tone. I could not believe the difference when I cranked my amp up at the next rehearsal. The sound was tighter, clearer, and much more punchier. The cables are thicker than usual and the jacks feel much sturdier. The cables cost around £40 each which seems expensive but put this in to perspective. You spend £1000 on an amp and £1000 on a guitar so £40 to connect them together properly is not much. So remember choose your cables carefully. Find a lead that is of suitable quality to connect your hard earned instruments together and be prepared to spend a bit more time selecting cables.